It starts slowly. Unassuming. Quietly. Then, “The Rush” comes. And suddenly, no one is safe. Not your calmest manager or your newest waitress. It slices deep into waitstaff morale and cuts deeper into restaurant profits. It increases blood pressure, tempers, stress and turnover. It shrinks tips and swells feet. Who does it hurt? Guests. Servers. Managers. Trainers. Everybody. What is it? It’s called “the weeds” (or being “swamped”) and it’s a phenomenon found in every restaurant and bar we’ve ever seen. We all know how helpless-feeling and service-affecting “in the weeds” can be. What we don’t usually realize is that our servers do have the ability to control their sections instead of their sections controlling them. How? By following this four-step plan: Observe, Anticipate, Prioritize, Act. Train servers to take a few seconds to quickly observe their sections before they enter the dining. By scanning the faces of guests and the tabletops in front of them, they can assess what guests will need next and which table to get to first, second, third, and so on. This can stop the weeds from creeping up. 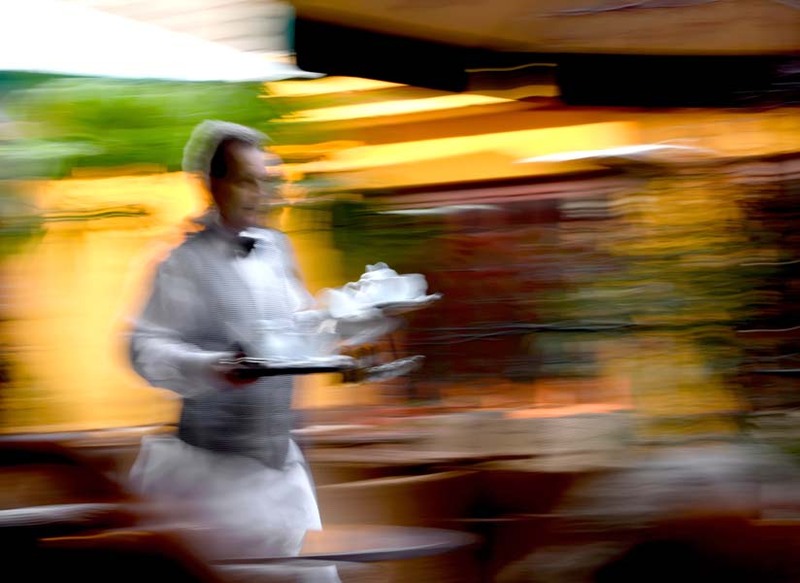 When your servers approach a newly-seated table, they should anticipate their guests needs by saying, “Can I get you something to drink from the bar? A glass of wine, a beer, a cocktail or maybe one of our great specialty drinks listed here.” Pointing to the drink menu, she continues, “We have Gold Margaritas on special today for only $4.75.” The guest now has an “overview” of the beverage selections (wine, beer, cocktails, specialty drinks) and the daily drink special. The server has helped guide the guest to a quicker decision, and avoided the weeds with this table. The next step for servers (and managers) to effectively guide their guests is to prioritize the needs of everyone in their section. Which of the tables needs attention first? Who’s second? Third? In general, the following four diners should always warrant servers’ primary attention, though not necessarily in this order. This is the message to send to servers: Servers, don’t “wait” on your section, control it. Serve, suggest, sell. Don’t fall victim to the myth that once your station or section is full, now you’re too far in the weeds to suggest appetizers, sides, wines or desserts. That’s backwards logic. Your stations are full, brimming with opportunity (and potential tips!) so “make hay while the sun shines.” Suggestive selling is the key to being in the money and out of the weeds. Excerpted from the book Service That Sells! The Art of Profitable Hospitality.